You have probably read about it in the news: bee populations all around the world are in decline. One of the main causes is the limited availability of habitat due to the high rate of urbanization. To help the bee populations on a local level, the FFN Academy joined forces with the Green Office Utrecht and organized a workshop on how to build a bee and insect hotel. The workshop started with a bee introduction on solitary bees by dr. Marie José Duchateau from the department of Environmental Biology from Utrecht University. She explained all about the life cycle of solitary bees and their highly important role as pollinators. Like honey bees, solitary bees pollinate flowers and crops for our own food production. Without these pollinators, a lot of fruits and vegetables would be lost. For example, did you know that almost all tomatoes we eat are pollinated by bees? Marie José continued by explaining that small-scale biotopes are essential for the survival of bees. Unlike honey bees, solitary bees do not live in hives but have solitary nesting sites (as indicated by their name). Solitary bees are not able to travel long distances, making it difficult for bees and insects too find suitable nesting sites and food in urban areas. Knowing these species are declining, we cannot sit still and do nothing! Marie José explained that with just a little effort, people can help out bees and other insects. She told us about ‘bee and insect hotels’, which are constructions made to accommodate solitary bees and other insects such as ladybugs. Bee hotels are on sale everywhere now, but you can easily build your own accessible nesting sites for solitary bees and transform your backyard into a bee-friendly garden. After the great lecture, it was time to build our very own bee hotel. The FFN Academy and Green Office provided the participants with all the equipment and materials they needed. With approval and support from Utrecht University, we were able to place a large bee hotel at the Uithof near the Botanical Gardens. Half of the workshop participants went outside to build a big bee hotel and thanks to everyone’s hard work it came out great. The bee hotel will stay for around three years and will hopefully be able to support lots of bees and other insects. Definitely have a look if you are curious to see how a real, big bee hotel looks like! 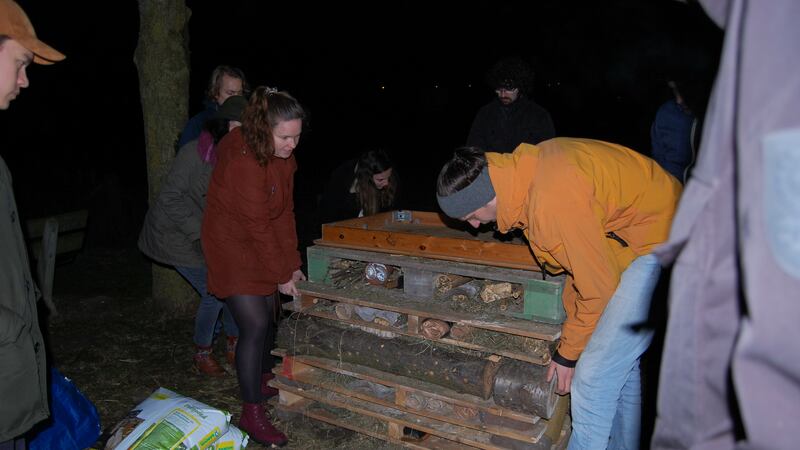 The other half of the group remained inside and built smaller, portable bee hotels, which they were able to take home. These small hotels can easily be placed around homes or in gardens, preferable within 250 meters of a flower field. If you read this and are inspired to make your own bee hotel, have a look online for building-tutorials. After making it, the only thing left is to place the small hotel outside and make sure that there are flowers around. If you have a garden or balcony, but do not want a bee hotel, another way to help is to plant as many flowers as possible. This not only brightens up your outside area, but provides all kinds of bees and insects with the food they need! Ever wondered what life is like as a conservationist? If you are, you are not alone! Almost one hundred participants joined FFN Academy for an inspiring lecture by Antoinette van de Water. This ‘Heldin van de Wildernis’ just came back from Thailand and was kind enough to step by in Utrecht to tell us all about her volunteer work in an elephant sanctuary and about her life-long mission to restore people’s ability to co-exist with elephants. Antoinette is the founder of ‘Bring the Elephant Home‘, a foundation that fights for the protection of elephants and their habitat together with local organisations and people in Thailand and Borneo. After many years of fighting for the freedom of elephants that are abused in the Thai tourist industry, Antoinette and her foundation are now fully focussed on wildlife conservation efforts. In her lecture she particularly showed us how science has been crucial to demonstrate the effectiveness of several solutions to reduce human-elephant conflicts and thus to convince people to take action. Under the supervision of Future for Nature Award winner Dr. Lucy King, Antoinette has now successfully tested beehive fences as an elephant deterrent measure in Thailand. At first, the local farmers did not understand how the beehives would prevent the elephants from destroying their crops. However, Antoinette’s carefully designed projects helped her gain the trust of local people. Now many of the farmers co-exist peacefully with elephants. Some farmers even abandoned their initial crops and are now fully focussed on the production of honey! A win-win situation! One might think that Antoinette would take a break after this success story, yet this is far from the truth. She is in the middle of moving to South Africa to set up a new research station and continue her research on bee-hives and elephants. Antoinette explained that the situation in South Africa is very different from what she experienced in Thailand. For example, the main threat for the African elephants is not the destruction of habitat, but the illegal killing of elephants for their ivory tusks. Also the rules and legislation in South Africa on human-elephant conflicts are quite different from those in Thailand. Antoinette showed us that conservation together with science and perseverance can really make a difference and I think that I speak on behalf of all other visitors if I say that we all truly felt inspired by her talk! Together with Friends of the Earth Netherlands (Milieudefensie) FFN Academy organized three interactive evenings on palm oil to create awareness and help kick-off the campaign ‘Draw the line’ from MilieuDefensie. 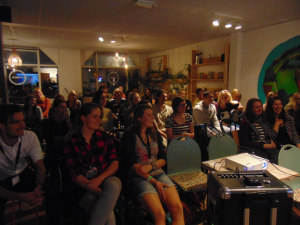 In Utrecht, Wageningen and Amsterdam the documentary Appetite for Destruction was broadcasted. It showed us the devastating consequences of the palm oil industry both for the forest and its inhabitants. A video message from Alexandra Vosmear and Dirk-Jan Oudshoorn, recorded especially for this occasion stressed this even more. Next to the documentary, in each city a different speaker was invited to give a talk on the topic and to lead the discussion afterwards. 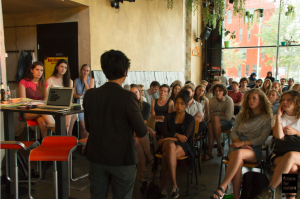 In Amsterdam we had the honour to have FFN Award winner Farwiza Farhan speaking from her experiences in Indonesia. 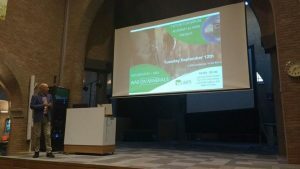 In Wageningen, Dr. Michiel Köhne highlighted the social impact of the palm oil industry and in Utrecht Dr. Pita Verweij focussed on problems and solutions on the palm oil issue. We were pleasantly surprised by the many people that attended these evenings and we thank MilieuDefensie for the nice collaboration! What do you do when you are an established ecological organization who organizes a symposium and you want to reach more students? 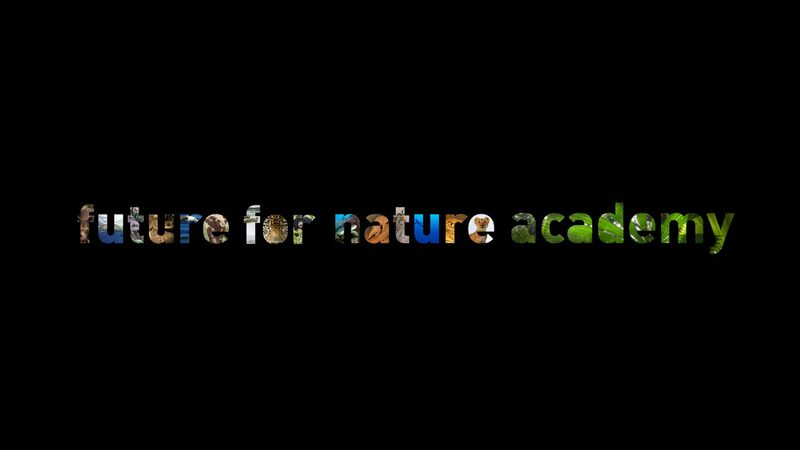 Collaborate with the Future For Nature Academy! 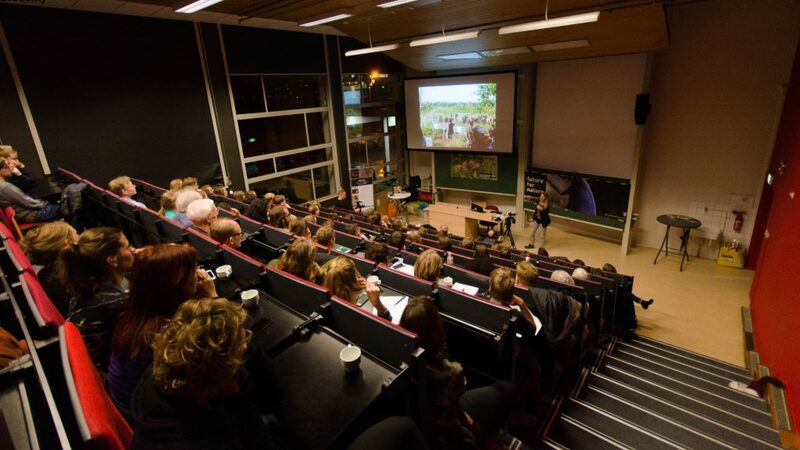 Together with NERN, the Future For Nature Academy organized the symposium “Innovation in Conservation – Fundamental science as a basis for sustainable conservation” in Lunteren on the 29th of November 2017. 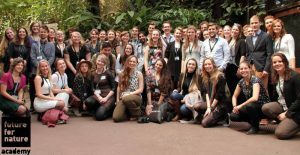 A unique chance for FFN Academy members and followers to get an insight in Ecology & Conservation research! The FFN Academy enhanced promotion by creating quote posters to introduce the speakers in the week before the event and shared it with our network. The symposium was a big success, over a 120 people were present. Most of them were students, eager to learn more about the work of the seven guest speakers. The speakers came from different disciplines and the day was hosted by the executive director of IUCN-NL Dr. Coenraad Krijger. It was a great day with lots of interesting discussions and ample network opportunities for FFN Academy members among researchers and NGO’s such as WWF and IUCN. For the Future For Nature Academy it was an extra surprise when we were given the opportunity to interview two of the international speakers. Videos of these interviews will follow soon! Dr Robert Kraus – Whole genome sequencing: Panacea for Conservation? 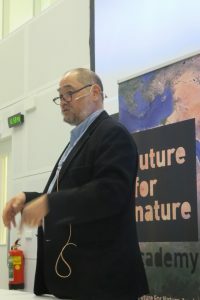 Prof. Eric Higgs – Innovations in restoration ecology: Fortress Restoration, or a flexible, adaptable approach? Interactive Documentary Evening featuring the “underhogs” and “chimpions” in animal research and nature conservation. On the 19th of September 2017, an interactive documentary evening was organized at the lovely location ‘THUIS’ in Wageningen with around 40-50 attendees. The evening was all about chimpanzees, who are often called “chimpions” in animal research and nature conservation, as they are a frequently studied primate species. On the other hand, the evening focused on the “underhogs” too, referring to the smallest pig species in the world called the ‘pygmy hog’. Both chimpanzees and pygmy hogs are endangered in the wild and need human intervention to thrive and survive. After a brief introduction by Manon de Visser about the Durrell Conservation Trust, we were lucky to have dr. Ole Madsen from the Animal Breeding and Genomics Centre in Wageningen as a speaker during the first half of the evening. He told the attendees all they needed to know about genomic research performed on Pygmy Hog DNA. This talk was followed by the documentary called “Durrell’s Underhogs” (2017). The movie explained the difficulties in managing a breeding and reintroduction program for a species that is so critically endangered. After the movie ended, the filmmaker Daniel Craven joined us through Skype to answer our burning questions and the eventual conversation was lovely and very inspiring. After a break with drinks and snacks, the second half of the evening focused on zoo-housed chimpanzees. Manon de Visser told the audience about the Jane Goodall Institute Global and how this organization is working not only for the welfare and conservation of wild chimpanzees, but also captive chimpanzees. Afterwards, the movie “A Week To Change” (2017) by Hilda Tresz was shown. Also Hilda was able to join us over Skype for an interesting, passionate discussion. In the end, the evening was truly unique and inspiring. Especially the chance to meet the filmmakers made many people interested and enthusiastic. Not only students joined, but also professors, animal caretakers from Dutch zoos, and people working for various NGO’s. It would be great if we, as Future For Nature Academy, will have a chance to re-do this activity at another location in the country so we can inspire and educate even more people about the conservation needs of these amazing animals. Daniel Craven is the Volunteer Manager of the Wildlife Conservation Trust and he is based in Jersey Zoo. He is also filmmaker of “Durrell’s Underhogs”. On Tuesday September 12th (2017) the Future For Nature Academy & study association LaarX presented the documentary ‘War on Minerals’ and Q&A with documentary maker Jacco Groen. In 2012, 147 nature conservationist from all over the world were murdered. One of them was a Dutchman: Willem Geertman. The documentary ‘War on Minerals’ tells his story. In the movie, Jacco Groen investigates how the murder exactly could have taken place. Furthermore he dives into the world of conflicting interests, which causes conservationist like Willem to fear for their lives. After the movie, documentary maker Jacco Groen answered questions about the documentary, and the battle the nature conservationists are facing fighting for the dangers that are threatening Earth’s biodiversity on a daily basis and fighting for their own lives. As true heroes, these individuals make a real difference! It was an intense but unforgettable and inspiring documentary, where over 70 people attended. Would it be possible to create a viable currency based on ecosystem function that would remove the current incentive to degrade natural systems and replace it with an incentive to conserve all remaining functional systems and regenerate all degraded landscapes? This was the main topic of the workshop given by John D. Liu. The workshop was attended by 20 people with different backgrounds ranging from students studying Forest and Nature Conservation, to employees of the World Soil Museum to an entrepreneur. A very diverse audience! The workshop was in the form of a discussion where the attendees discussed how we seem to value things we make, higher than natural ecosystem functions. Resulting in biodiversity loss, deforestation, desertification and other visible effects on nature. To combat these problems the possibility of creating a viable currency based on ecosystem function was evaluated. How can nature be turned into something that will be perceived as valuable and investable? During the lecture that followed, attended by over a 100 people, John D. Liu shared his background and his journey to how he has come to his role as large-scale ecosystem restoration advisor today. He shared his global observations of desertification and how he learned more about the rehabilitation of landscapes. He rounded off with a positive note, highlighting the establishment of Ecosystem Restauration Camps. John D. Liu is Chinese American film-maker and ecologist who for many years has been observing, documenting and communicating about large-scale ecosystem restoration. Some of you may know him from the documentary ‘Green Gold’ shown on the VPRO programme Tegenlicht. His documentaries and speeches contribute significantly to the global awareness among world leaders. For 3 years Liu was a senior research fellow at the International Union for Conservation of Nature (IUCN). Currently John D. Liu is the Ecosystem ambassador for the Commonland Foundation. In 2015 he was also named Visiting Fellow at the Netherlands Institute of Ecology (NIOO). John’s published papers and films are collected at the following URL: https://knaw.academia.edu/JohnDLiu. If protecting one of the most precious ecosystems in the world is your daily work, you probably have a lot of interesting things to tell. 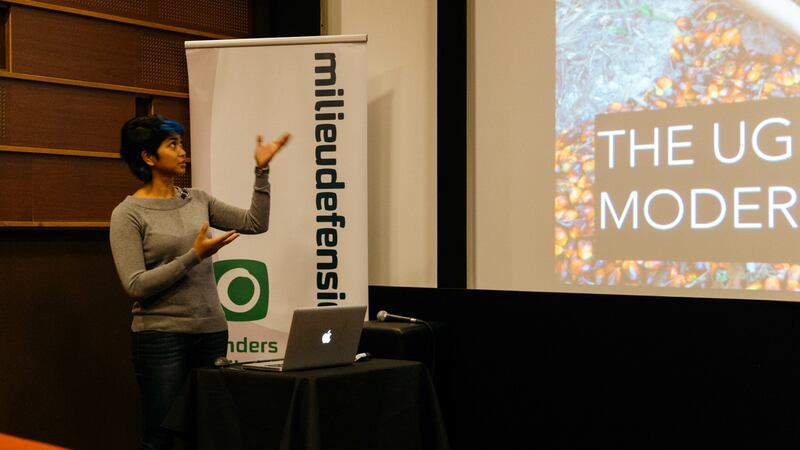 Indeed, during her interactive lecture in Amsterdam, Farwiza Farhan showed us how complex her work is, but even more how important it is to conserve the last place on earth where rhinos, tigers, bears, orangutans and elephants roam together. Farwiza is the founder of the HAkA, an organisation that defends local livelihood and the nature in the Sumatran Leuser ecosystem. The thing that struck me most are all the different things Farwiza and her organisation do to protect the Leuser ecosystem. It’s not just about doing research or patrolling the forest, conservation also involves lobbying, informing, listening to the voice of local people and actively restoring parts of the ecosystem. All of these are part of Farwiza’s daily activities. During her talk, Farwiza stressed that despite the many setbacks, there is still a spirit of conservation optimism. Amongst many setbacks, there is successes to be celebrated. People in the western world are more and more aware of the problems that the consumption of palm oil is causing. Also, Farwiza explained that after a couple of weeks after the palm oil plantation is brought down, the first elephants already return to the area! Restoration is possible. However, for orangutans this takes much longer, she said. It is incredible to see the amount of effort they all put in the HAkA organisation, but this shows that there still is a lot of work to do. Farwiza showed us that conservationists can really make a difference and I think that I speak on behalf of all other visitors if I say that we all truly felt inspired by her talk. In the afterglow of the Future for Nature Academy Day, the FFN Academy members and all the buddies were granted the opportunity to attend the Future for Nature Award Ceremony of 2017! After a guided tour through the Burgers Zoo in the morning, the award ceremony started. Accompanied by His Majesty King Willem-Alexander, the guest of honour, the three fresh Future for Nature Award Winners of 2017, Shariar Caesar Rahman, Farwiza Farhan and Hana Ridha presented their truly inspiring stories. Deserved winners! Despite encountering many real-world obstacles and challenges, the winners’ work represents their boundless effort to save the species and ecosystems that they are so passionate about. Each of winners is handed the beautiful Future for Nature Award, a symbol that acknowledges the importance to conserve our precious environment. After the ceremony, the buddies are ready and excited to represent the Future for Nature Award winners, provided with banners and flyers and there is time to talk conservation over drinks and bites. The winners managed to convey their passion for conservation to the crowd, who eventually returned home, fuelled with inspiration and confident of an optimistic ‘Future for Nature’. The big day we’ve all been looking forward to had finally arrived: the (first) Future for Nature Academy Day! On Thursday 30 March, at half past three, a bus arrives in Wageningen, carrying 25 Future for Nature Award winners. The day prior to the ten year anniversary of the Future for Nature Awards, we are lucky to have invited all the FFN winners of the past decade. 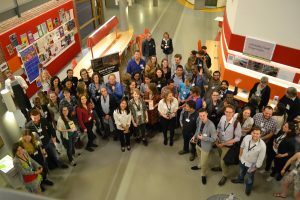 Upon arrival at the GAIA building in Wageningen the winners are welcomed by their ‘buddies’; more than 30 students who were selected for a special Meet&Greet and will take on the role of spokesmen for the winners at the ceremony Award show the next day. Prior to this day, the buddies worked hard to make beautiful and informative flyers about their conservation heroes, to spread amongst students and other people who are interested. The winners and buddies meet over a cup of tea and, excited as they are, the buddies are eagerly listening to the motivating stories of the winners. In the meanwhile, the GAIA hall is filling up with almost 200 enthusiastic participants. 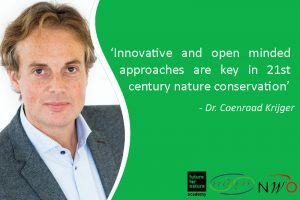 At 16:00 o’clock, everyone is warmly welcomed by Rascha Nuijten, co-founder of the Future for Nature Academy, and Louise Vet, director of NIOO (Netherlands Institute of Ecology). With her words “So, I think it is time for a movement”, Louise Vet sets the tone for an inspiring and optimistic event. During various workshops the winners, buddies and all other participants discuss important topics in conservation. The role of science, communication, finances, policy making and engaging local communities in conservation are topics covered during lively debates. The first-hand examples from the FFN winners were inspiring and food for thought for all participants. We learned that what is taught at University provides a good foundation, yet when it comes to hands-on conservation work in the field, there is much more to learn and we need a broader toolbox. There is no ‘Blueprint for Conservation’ and many challenges to be dealt with occur along the way, such as almost ineradicable corruption. “This is not a 9 to 5 job”. “There are no holidays in this job. It’s a passion” are Patricia Medici’s (FFN Award Winner 2008) closing words for the evening. Is there a Future for Nature? “It’s tough, very tough. But we have to. And yes, there is hope if we all work together”, according to Ofir Drori (FFN Award winner 2011). He adds that by working together “we all get to do what we love”. Conservation is not a job, it is something you are.